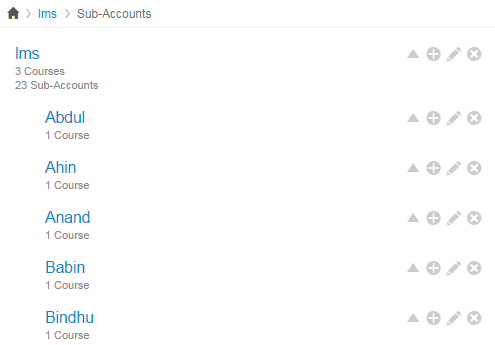 How do I organize sub-accounts? Sub-accounts are often used to manage permissions and organizational hierarchy within an institution. For example, sub-accounts can be created for individual colleges within a university, or for schools within a district. Sub-accounts can also be created within sub-accounts, such as when a college subdivides into departments that subdivide into programs, or a school that subdivides into grade levels that subdivide into specific subjects. Many clients set up sub-account organizational structures that mirror their SIS or registration systems. Sub-accounts can be manually or automatically created within Sublime LMS using integrations from other systems. Admins, users, and courses can be assigned to sub-accounts. A user can hold different roles in each sub-account. Sub-accounts can be used to create and access question banks, outcomes, rubrics, grading schemes, reports, and analytics. Permissions within sub-accounts flow downward by default. For example, an admin at the top-level account or sub-account will be an admin in every sub-account below the account or sub-accounts. Although terms cannot be created in sub-accounts, many clients will create terms at the top account level that can be used by specific sub-accounts so each can have different access dates. Departments > Sub-Departments > Course Type. Note: Setting up groups for the purposes of collaboration is better handled through building courses or groups under the appropriate sub-account level, since you can't assign non-admins to sub-accounts.